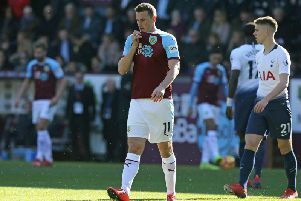 Chris Wood is hoping to hold onto his Turf Moor golden boot as the club’s top scorer in the remaining six games - and fire Burnley to safety. Wood netted on the last day of last season, at home to tomorrow’s opponents Bournemouth, to claim his 10th Premier League goal, and 11th in all competitions, to top strike partner Ashley Barnes by one. This term, the pair are again nip and tuck, both on 10 goals in all competitions, with Barnes boasting nine in the top flight, to Wood’s seven. Wood feels the pair bring the best out of each other - between them they have 13 in 13 games as Burnley have enjoyed a strong second half of the season so far. And Wood said: “It was a nice competition last year, and hopefully it will be the same again, with a few more goals for each of us. “That’s the key, to keep pushing each other. “We’ve struck up a good partnership and we seem to play well together, hopefully we can keep that going this season and into the next. “We work well together, even when the game isn’t going our way, but we strive on service, and when we get that, we know we can finish and score goals. The pair have clicked again since Boxing Day, and Wood added: “The last six months or so we’ve been very good, it’s nice to form that partnership again. “We’ve had games where we haven’t scored or won, but we’ve played well as a partnership and take pride in that. Another member of the striking pool won’t be available at Bournemouth tomorrow, with Peter Crouch having appendix surgery, but Wood explains he has been a big help after arriving in January: “He’s been great, he knows everything about the game, he’s been around a long time and shows his insights into football. “He’s been brilliant for the dressing room and come on and made an impact off the bench when we’ve needed him, he’s a fantastic player that way.